It is traditional at this time of year for Vicars to write about the changing of the seasons, Harvest Festival, Remembrance Sunday and to even look forward to Christmas. I know that I have done all of those things in the past, and will probably do them again in the future. However, I am going to take a slightly different tack on this occasion and I beg your indulgence whilst I do so. As you probably know Eve Griffiths is the editor of this august publication and I received her email asking for articles whilst I was driving a narrow boat around the Four Counties Ring (Shropshire, Staffordshire, Cheshire and the West Midlands since you ask) and I decided that I would share with you something of my passion for the canals. Being a Vicar there are some lessons to be learnt from life on the canal, and I will come to those, but principally I wanted to let you know why I spend most of my holidays in places not normally associated with holidays. Actually, it is something of a miracle that I enjoy narrow boating at all as my first two experiences were not exactly auspicious. My very first time on the canal was when I was a sixth former and went on a school trip. My main memory of that holiday was motoring through the centre of Coventry, which looked extremely run down at the time, feeling quite hungover (this was the 1980s and the teachers seemed quite relaxed about sixth formers drinking on school trips) and seeing something dead and smelly float past. I felt rather ill. Glamorous it was not. The second, inauspicious, trip was around the Avon Ring with my in-laws. Let’s just say that there were quite a few people in quite a small space and that in such circumstances it is possible to be less than harmonious. Whenever I got on the tiller I always tweaked the speed up in the hope that it would get us home earlier, but to no avail. But, despite these early experiences, I still harboured a desire to give it another go and periodically pestered Vivienne about it. She was a bit less keen as she also remembered the previous trip and, for a while, the children were both too young. Eventually, when Henry reached the grand old age of 3, she was persuaded and we rented Gustavus for the week. Our adventure for the week was to be the Stourport ring. This started and finished in Worcester and went up into Birmingham, Wolverhampton, Stourport and then back down the river Severn. Although we had a marvelous week it was very much a ‘full on’ introduction to the world of canals as we had to tackle the Tardebigge locks, a flight of 30, on our second day and, it turned out, that this ring is better suited to a two week rather than a one week trip; this realization dawned on us about half way through the week and we ended up doing some long days motoring! However, that is not actually as bad as it sounds. A day of motoring the boat could not be more different from a day of driving a car. 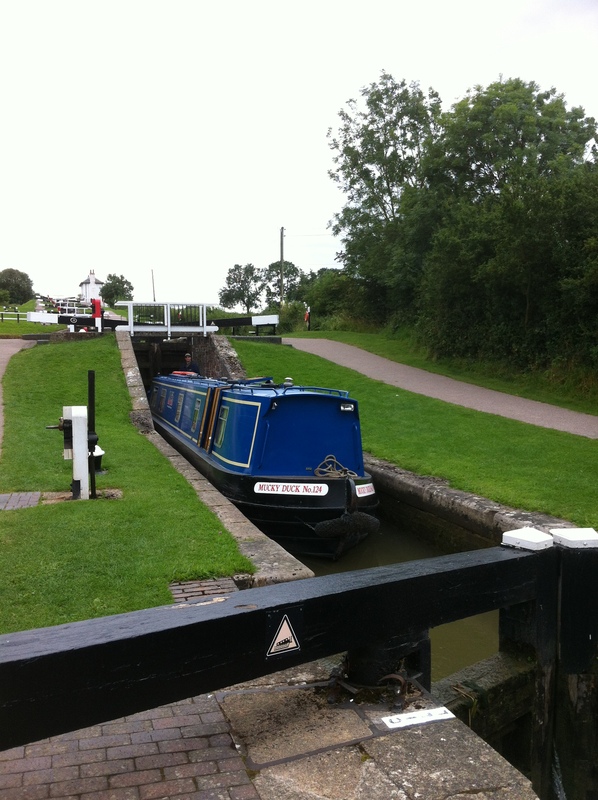 Firstly you cannot go more than 3 or 4 miles an hour – often less if you are passing moored boats or going through locks. There is therefore none of the stress normally associated with travel; it is slow, you know it is going to be slow and you have no choice other than to fully enter into the slowness. This, in itself, is a marvelous antidote to so much of modern life and is one of the reasons I would not hesitate to recommend this holiday to anyone who just needs to slow down a little. The other major difference with driving a car is that you are standing in the open and often travelling through some wonderful landscapes, both rural and even post-industrial. We have been through some traditionally beautiful countryside where the canal feels many miles from anywhere else, passed lock-keeper’s cottages which were so remote that they had no road going to them (Vivienne is still worried about how one gets deliveries there), but also motored through landscapes which used to be full of factories and warehouses (the reason the canal was there at all of course) and these are equally fascinating as you have time to ponder how different things must have been in their heyday. Anyway, at the end of the Stourport Ring the bug had well and truly bitten and there was little doubt that this was something we wanted to do again. The problem was how. 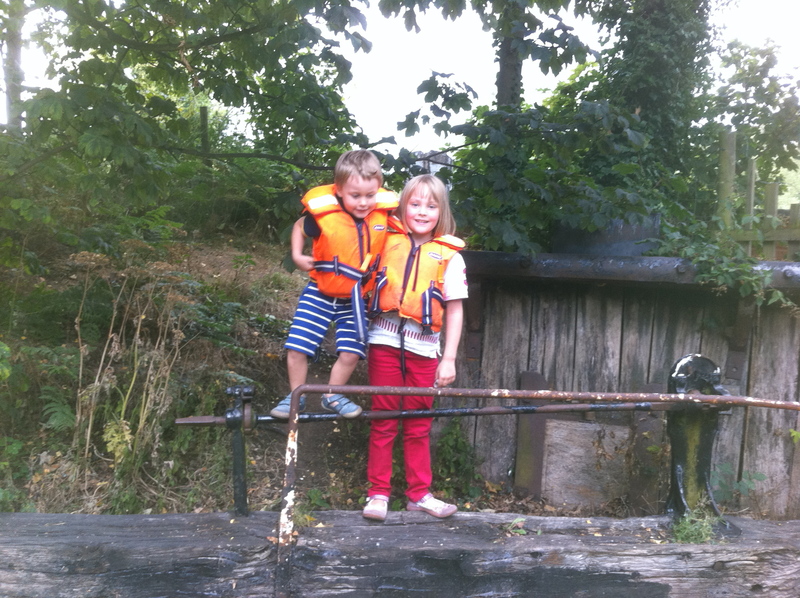 Narrowboats in the summer are not cheap and stipends are not high. We had largely paid for Gustavus using several years worth of Tescos Clubcard points, but this is not something one could rely on annually. Fortunately I had spotted a boat sporting the livery of the ‘Canal Boat Club’. Through the power of Google I discovered that this was a timeshare style company that allowed you to buy a week on any of their boats for much less than a traditional hire. This we duly did and, for the next few years, we had one week each summer on board a different Canal Boat Club boat. During this time we had some great trips on the Leicester Arm of the Grand Union Canal (Foxton locks, Market Harborough), along the Oxford Canal (including Brauston Turn where we met a boat covered in about 20 clowns, really), the Stratford-upon-Avon canal where we moored near the RSC theatre, the Kennet and Avon canal during which we moored both in the centre of Bath and in the Floating Harbour in Bristol, opposite the SS Great Britain, and the Llangollen canal which including driving over the Pontcysllte Aqueduct, which is basically a long trough of water suspended 126 feet over the River Dee by Thomas Telford’s engineering. Whilst these trips were all great we began to hanker for the ability to take longer trips and perhaps on a slightly more personal-feeling boat. Again the question was how. It was obvious that we could not have our own narrow boat but was there another way to give us more time on the water without breaking the bank? Again using the power of Google we discovered the joys of boat-sharing. This involved not buying a week’s timeshare (where we never own anything as such) but joining a syndicate of like-minded people and buying an 8% share in an actual boat. This gives between 3 and 4 weeks use of the boat each year, again for a fraction of the cost of hiring, and sharing all the running costs between you. After much research, and a trip to a freezing Nuneaton in February last year, we discovered Tottleworth. 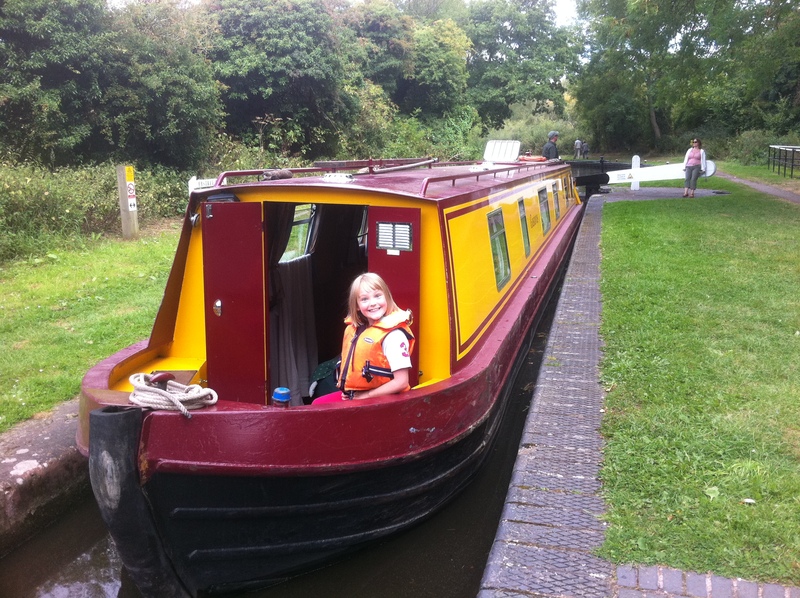 She is a 60 foot long, six berth narrow boat, of whom we are now part owners. Last summer we took Tottleworth for a two week trip down the Oxford Canal and spent some time moored amongst the dreaming spires. I also spent some time diving down to the bottom of the canal looking in vain for Vivienne’s glasses, but that is another story! In the Autumn we motored up the beautiful and remote Ashby Canal. This was our first time on the boat ‘out of season’ and, although it was quite chilly at times we were comforted by the log burner and frequent applications of hot chocolate. 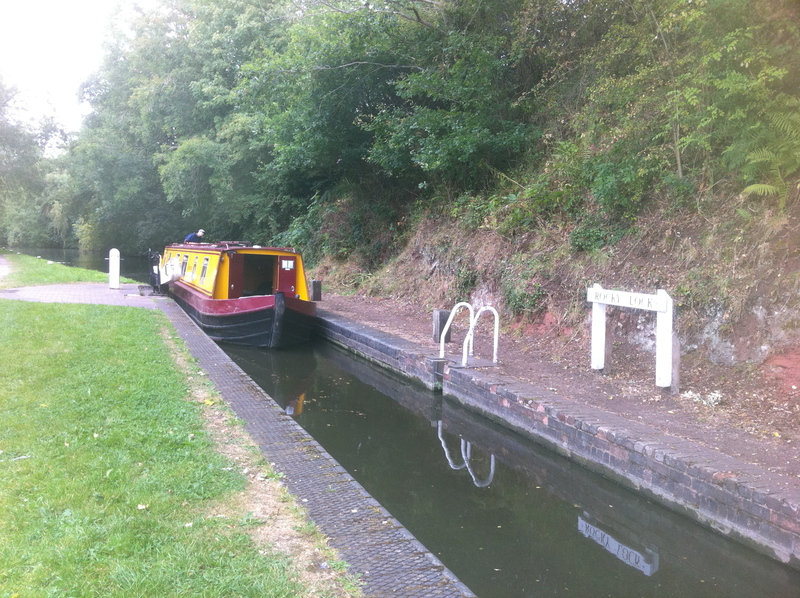 This summer has seen us cruise around the Four Counties Ring (as mentioned above) and, in October, it looks as though we will be heading up the Bridgewater Canal and mooring in the middle of Manchester, for something of a contrast! There are over 2000 miles of navigable canals in England & Wales and, despite all these trips, we have only just scratched the surface – there are still all the Pennine canals to tackle, including the ‘Everest’ of the canal system which is Standedge Tunnel on the Huddersfield Narrow Canal. This involves a climb of 29 locks, a passage through the tunnel which takes almost two hours and a descent of 20 locks. Can’t wait! So what do I really love about being on the canals? Well, it is neither the luxury nor always the weather (although we have often been lucky). I love the pace of life which cannot fail to unwind you, I love both the remoteness of some canals and being in the centre of cities on others, I love the fact that we have explored so many parts of the country which so many people (especially from the South East) would never venture, I love being amongst both wildlife and human history but, above all, I love the sense of community and ‘otherness’ which pervades the canal world. People will talk to complete strangers and exchange stories and tips as they pass, people will help each other through locks or out of tricky situations, children (and adults) love to wave at boats as they pass by. The canals are a real community, and it is a diverse and interesting community. It contains everything from wealthy retired couples living on their brand new gin-palaces to those who have dropped out of society and live on floating wrecks, and everything in between. But it is a place where people smile and where people have time for one another. That seems like a lesson worthy of translating into everyday life. Whenever I mention going on the canals people nearly always say to me “I have always wanted to do that.” If you fall into that category then do give it a go – it may be the start of a love affair that will change your life! Canon Andrew White, the Vicar of Baghdad, is coming to St Mary’s Hadlow to speak about his life and ministry in Iraq. It should be a fascinating and inspirational evening, hearing about Christian ministry being exercised in a frequently hostile and violent environment. Canon Andrew is coming to St Mary’s Hadlow on Tuesday 2 July at 7.30 for 8.00 pm start. St Mary’s is in Church Street Hadlow, TN11 0DB. However parking is limited so please park and walk if possible.